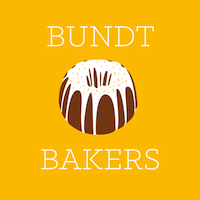 Our Bundt theme this month was chosen by Lauren of Sew You Think You Can Cook. I was very excited when Lauren chose cinnamon as the theme. First, because I LOVE cinnamon. Second, because I think it is a perfect, warm, cold-weather flavor. Lastly, because I have been wanting to make Monkey Bread. Believe it or not, I had never made nor even eaten Monkey Bread before I made it for this challenge. I thought it was very good but a little too sweet for my taste. I'm going to make it again but I am thinking of adding some fresh fruit to it before baking, maybe some tart apples too offset some of the sweetness. My husband and Mom Klik, on the other hand, absolutely LOVED it. I don't know why I have never made it before now. It is super easy. When my kids were young I used to make doughnuts using refrigerated biscuit dough and shake them in cinnamon sugar. This tasted much the same but with caramel all over it. We were invited over to Frank's sisters for dinner Saturday after which we could spend some time with Mom Klik, playing pinochle. That is Mom's favorite. Right up there with going to play bingo. Her health isn't allowing her to go to the bingo hall right now so pinochle it is. Dinner was just an added bonus so I told Roz that I would bring dessert. 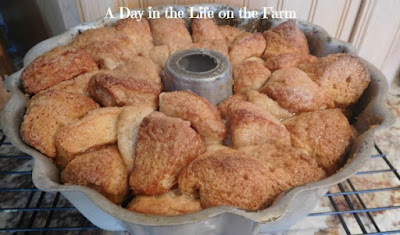 I didn't even remember hearing about Monkey Bread until a few years ago when I began following Pinterest. Roz told me she had made Monkey Bread before and that it was all the rage twenty or thirty years ago. I must have been under my rock because I knew nothing!! While enjoying our dessert, we started wondering how this got the name "Monkey" bread. My best guess was that it was so easy to make a monkey could do it. But it got me to wondering and so I came home and did a google search. Monkey bread, also called monkey puzzle bread, sticky bread, African coffee cake, golden crown, pinch-me cake, andpluck-it cake is a sweet, sticky, gooey pastry served in the United States for breakfast or as a treat. It consists of pieces of soft bread with cinnamon sprinkled on it and is often served at fairs and other parks. The origin of the term "monkey bread" is uncertain. One possible etymology is the bread's resemblance to the fruit of the monkey puzzle tree. So there you have it. We still don't know, for certain, why it is called monkey bread. 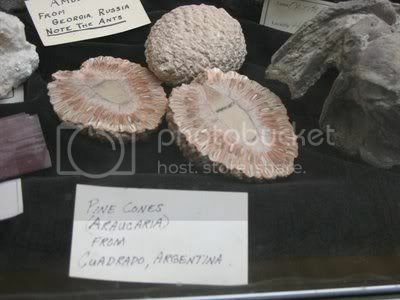 This got me curiouser though (yes, it's a word....just ask Alice in Wonderland) so I looked for an image of the fruit. I don't really see it but then again, I have evidently spent much of my life underneath a rock so what the heck do I know?!! Well I do know something.....I know this bread is the perfect recipe.....easy peasy and delicious....Enjoy!! Prepare a bundt pan using cooking or baking spray. Divide the biscuits into 16 pieces and then cut each piece into quarters. Place cinnamon and sugar in a large plastic bag, shake to combine. Add the biscuit quarters to the bag and shake to coat. Pour into the prepared bundt pan. Stir the brown sugar into the butter and pour this mixture over the biscuits in the pan. Bake in a preheated 350* oven for approx. half an hour. Until puffed, golden brown and no longer doughy in center. Let cool in pan on rack for 10 minutes before turning onto a serving plate. Look at all these wonderful Cinnamon Bundts! I can't believe I hadn't tried it before and I will be making it again. Make sure you try this one Lara, so easy peasy you will be wondering what took you so long. It didn't last long here either Rebekah. I was just looking in the fridge last night to see if I had biscuits to make Monkey Bread. I can't believe you have never made it before. It doesn't last long at this house!! I can't believe you've never made Monkey Bread before. So glad you finally got around to it! What a great idea using the Bundt pan! Let me know if you learn anything more than I please. 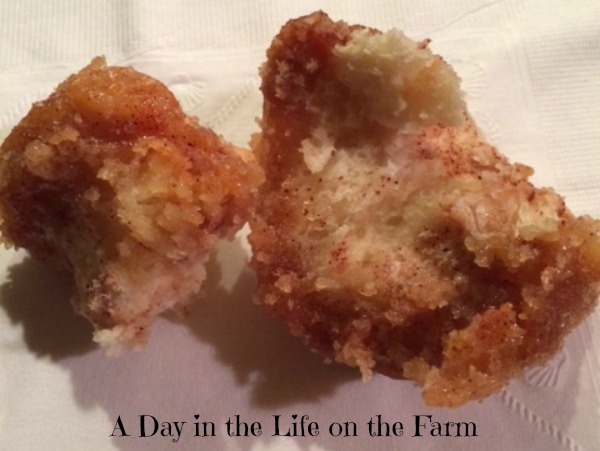 Monkey bread is delicious isn't it, it's the ultimate dessert to showcase cinnamon off. It is Laura. I'm glad I finally got to make it. your glaze looks absolutely divine, my dear. 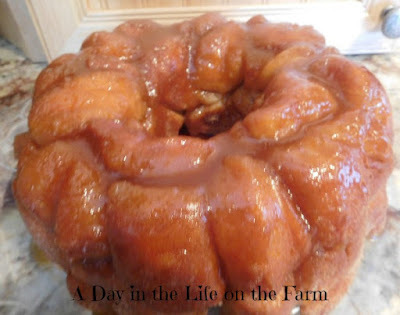 I love making monkey bread but I have never made it in a bundt pan. Great idea and I'll try it next time I make it. I've made monkey bread only once, my brother makes it quite often. I just never think about it. Thanks for bringing it to the party this month. You are welcome Lauren, it was a fun dish to share. I've never had monkey bread, but I've definitely been meaning to try it! This looks so fluffy, golden, and delicious! You really need to make it Amanda. Recipes don't get much easier than this.